among your BBQ Tools accessories that will save you valuable time. VERSATILE - Suitable for most grill types including gas, charcoal and infrared. We even used it on our range racks! 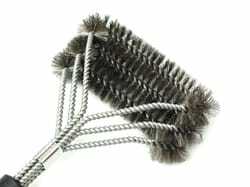 HIGHLY RATED -This new design with the cleaning wire wound around the reinforced shafts to help reduce shedding of bristles is among the highest rated brushes on the market for removing the toughest charred remains. TOUGH AND DURABLE - Made from tough woven stainless steel wire, it will not flatten on first use. Scrub rinse and hang to dry. Easy! 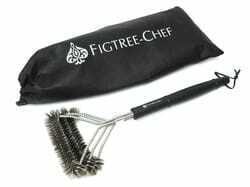 BUY TOGETHER WITH OUR FIGREE-CHEF BBQ Tools Set for a 5 star gift? Just in case you aren't already totally convinced... All our products come with a 100% Satisfaction Guarantee. If you aren't totally satisfied with your order, simply return the item unused in the original packaging and we will be more than happy to issue your refund. So what are you waiting for? Click below to make your purchase and get in on your part of the action - join the thousands of happy customers today! You won't regret it!